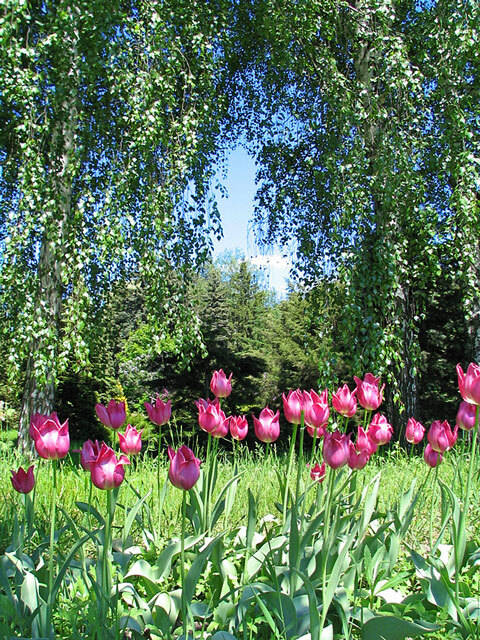 Pink and white tulips sway in a botanical garden on a sunny day. The bright buds reach for the sky, which is visible through the surrounding green trees. While the setting is very natural, the planted flowers contribute to a slightly landscaped feel. A botanical garden comprises a collection of living plants that are brought together for the purpose of education, research, and conservation. Plants in a botanical garden are permanent and labeled, with the goal of helping viewers understand plants from a cultural, scientific, historical, technological, or natural history value. Many people consider botanical gardens a type of museum where the collections are plants. Collections of plants can be defined and categorized in a wide variety of ways. For example, a botanical garden may be organized around the relatively narrow focus of, say, orchids, or around a wider focus of plants indigenous to North America. When it comes to collecting plants, there are many different ways to do it, including purchasing, accepting as gifts, exchanging, field collection, and hybridization. In order to ensure the mission of the botanical garden is met, it's important that plants are acquired on a regular basis. Once plants are acquired, it's important that they are properly preserved and protected. In order for the collection to be properly preserved, it must be looked after by someone who understands plant care and horticultural practice. In order to be successful, botanical gardens must be ruled by policies that ensure that the collection meets its intended purpose, whether that purpose is to educate, to help with research, to help us understand our natural environment, or a combination of all of the above. These policies should include how to govern the collections, so that they adhere to the organization's mission. Three documents can help curators of botanical gardens effectively govern collections: a collections management policy, a collections management manual, and a collections plan. Documentation is an integral part of any botanical garden, and is the feature that distinguishes a botanical garden from a park. Botanical gardens can only serve their purpose if the information collected about them is accurate and updated. In addition, botanical gardens are typically legally obligated to maintain correct documentation and records. One of the main functions of a botanical garden is to serve as a research facility. Research may be done in the name of compiling facts about the plants, interpreting information, discovering new information or, often, all of the above. Botanical gardens also serve the public, and often feature educational programming for schools and the public.